MDS&W happened a week and a half ago. I’m just now getting around to writing about it as I’ve been lazy procrastinating working hard on getting Silver Screen Knits, Volume Two over the finish line. Good news: it’s being released the day after tomorrow! Once again, I went with my good friend Mandy (who was also my maid of honor, who is also my Knitty model, who is also awesome at roller derby and whose husband did some of the photo shoots for the book). I managed to get out of there without a single skein of yarn – a true feat for me – but I did get some other very neat stuff, mainly food. They have some fabulous food vendors. I realize that 90% of what I tweet and blog about is food related, but I like food, so yeah. What was I talking about? Oh, food. Justamere Tree Farm was there again with their maple candy. And maple cream. I’d never had maple cream before but they give you a little taste of it just like a crack dealer. I think my daughter has since eaten half the jar, so I may have to hide it. Then there was the cinnamon nuts (pecans, cashews, almonds) booth with a smell that wafts through the entire fairgrounds. Pure evil. And finally a new vendor I hadn’t seen before – Artichokes French. Apparently they had been at Rhinebeck previously and were overwhelmingling popular. I can see why. They’re one of the few vegetarian hot food vendors, half of their menu is gluten free and you can smell the garlic from 100 yards away. I couldn’t find a website for them but a recipe for the artichokes is here. Great stuff. Now for the non-food related stuff. 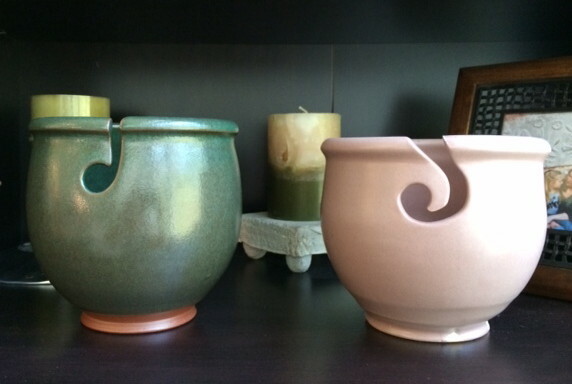 Last year, I got a gorgeous green yarn bowl (the left one below) from Greenbridge Pottery and found that I use it constantly. Aside from being very handy, it’s also a rather nice decorative piece so I headed to MDS&W intending to get another one. It was a challenge to settle on one as they have an enormous selection and they’re all lovely. I ended up with the one on the right. It’s a nice neutral color that will work well anywhere I leave it in my house. I also picked up some roving to make a bird nest material thing to hang outside. It’s been hanging out there for a week with no takers. Ingrates. Finally, the pièce de résistance: another yarn bowl. But not just any yarn bowl. 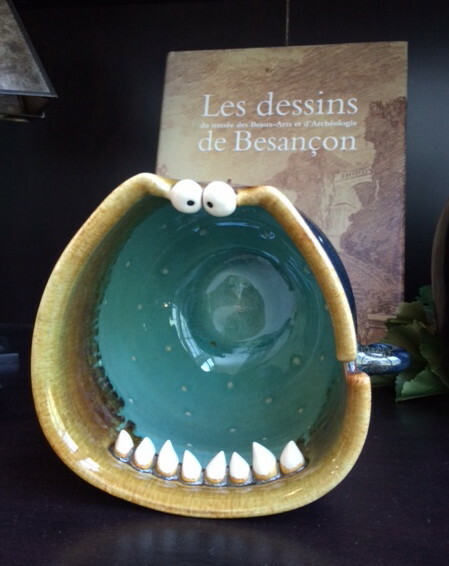 A monster yarn bowl! Check this guy out! That could not be any cooler, right? It was made by Claymonster Pottery in Baltimore, MD. The potters were kind enough to inform me that this yarn bowl is microwave and dishwasher safe. Can you imagine eating cereal or soup out of this? I can and I most likely will. Other than that, I wound up with a few more sets of circs, which puts me at about a thousand of them now but somehow I never have the size/length combo I need and I have far too many of them to chuck them all for interchangeables. At least I have an excuse to keep buying Namaste Circular Cases! Awwwww <3! Claymonster Pottery only seems to have a FB page so since I'm a Luddite about FB I don't know if they sell stuff online or what. If not, then hopefully they'll be there next year. I keep thinking of the toothbrush holders! Also, the Artichokes French. Ermagerd, will have to make some.